Wet, Dry & Permanent Markers erase from the mat. 24" x 30" Mat 1" squares on each side. Whether your players are trekking through the barren wastes of the high desert or exploring the crumbling ruins of ancient god-kings, no Game Master wants to spend time drawing windswept dunes and crumbling temple walls. Don't waste your time sketching when you could be playing! 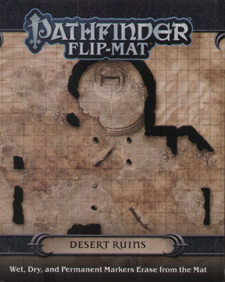 With Pathfinder Flip-Mat: Desert Ruins, you'll be ready next time your players step into the sand! With one side featuring the ruins of an ancient temple and the other a mysterious desert edifice at the end of a twisting sandstone canyon, this double-sided map is the perfect place for adventure in the high desert!